Teak is unique because it produces its own natural oil that makes it very low maintenance in comparison to other types of outdoor wood furniture. Furthermore, teak oil prevents water and moisture from sinking into the wood that can cause dry rot. If you don’t mind the grayish patina teak will develop overtime, teak requires virtually no maintenance and can be left on the patio without much more than an occasional dusting to keep it in pristine condition. 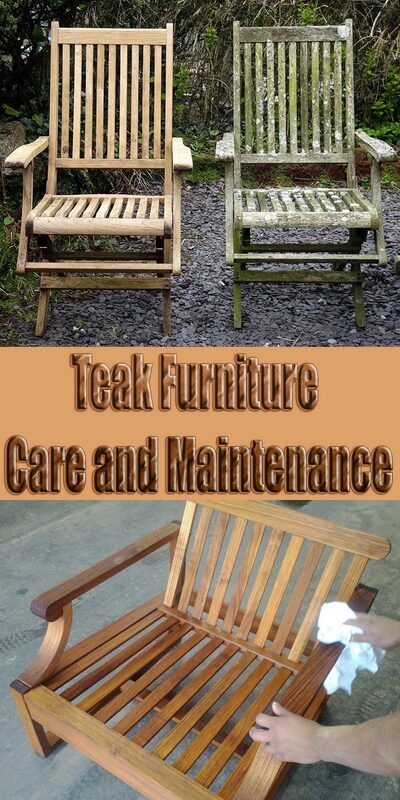 Below I will show you how to clean and care for you teak furniture as well as how to remove the silvery patina. Teak is a dense, hard deciduous tree found in tropical regions of the world like Burma and Thailand. Tectona Grandis (the real name for teak) is one of the most valuable timbers in the world and unmatched in durability and beauty. Teak wood is dense so it is not inclined to bend, warp, or crack over time. Natural oils prevent teak furniture from dry rot. Teak contains a natural resin that is a rubber-like substance. This resin acts as a natural repellent against insects and termites. Although it’s said that termites won’t eat teak, the truth is they will. Because of its inherent protective qualities, teak furniture costs more than other types of wood or metal furnishings. Teak is easy to clean. You can clean it using a brush and mild-dish soap. Always scrub with the grain for best results. 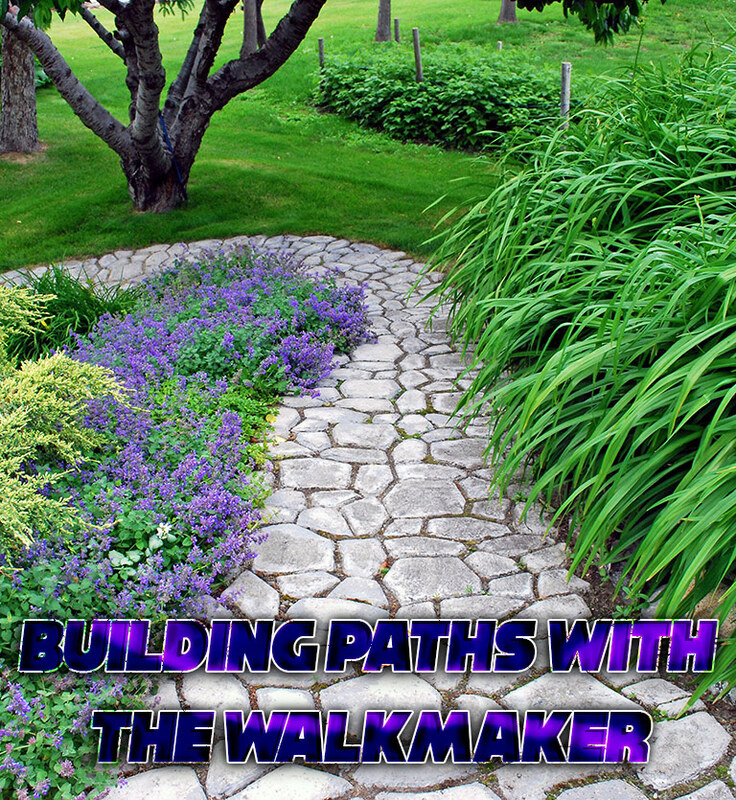 You can do this prior to the outdoor summer season. After this, you can usually just dust off your furniture with a soft cloth. To remove heavy stains, you can lightly sand away these areas with fine-grit sandpaper. 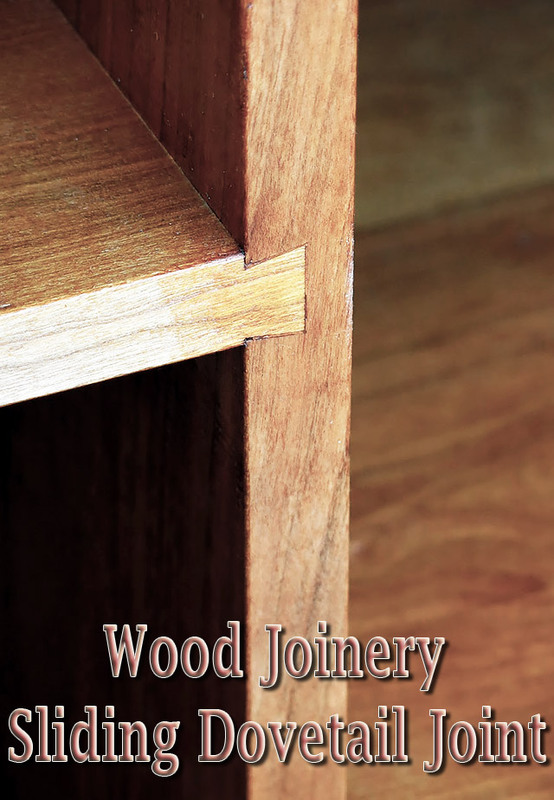 Refer to the section below to learn how to sand teak furniture. An easy trick that I learned to remove water stains is by using an clothing iron. It’s quick and easy and it really works. Grease stains are another beast but you can still get them out. You will need a commercial grade teak cleaner that can be purchased online or at a local hardware store. Golden Care Teak Cleaner is a product worth mentioning. Lightly sanding teak wood will reveal a fresh and glowing finish below the surface level. This will restore the original honey brown glow. Sanding can be a bit more difficult on furniture that has hard to reach areas so you have to work around these spots by hand. 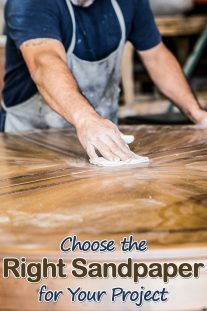 Once you’re finished sanding and removing dust, you can move on to seal the wood to preserve the hues of the wood. (Left-right) Teak with a Grayish Patina, Teak after Cleaning, and Sealed Teak. Sometimes you’ll hear that all you have to do is lightly oil teak furniture once a year. This is untrue because teak oil will not prevent fading and it can cause mildew. Remember, teak already produces a natural oil. It’s better to use teak sealers because they will protect furniture from losing the original golden hues. Teak sealant will typically last you a full year. You can find protective sealant to lessen the effects of the sun’s rays on your furniture. To apply teak sealant, leave your furniture out in the sun for 2 weeks to open up the grain. This will help the sealer adhere correctly. Then, spray the area with sealer using a steady hand. Next, rub the sealer into the wood using a lint-free cloth. Apply an additional coat of sealant for a optimum finish. It’s important to keep in mind that once you apply a teak sealer, your furniture will hold the color that it has at the time of sealing. This means that if you seal your teak when it still has the original golden color, it will not age to the silver-gray look. To preserve the antiquated aesthetic, you can seal you teak furniture once it develops the grayish patina. You can apply a clear coat once the sealant cures to give it an amazing sheen. 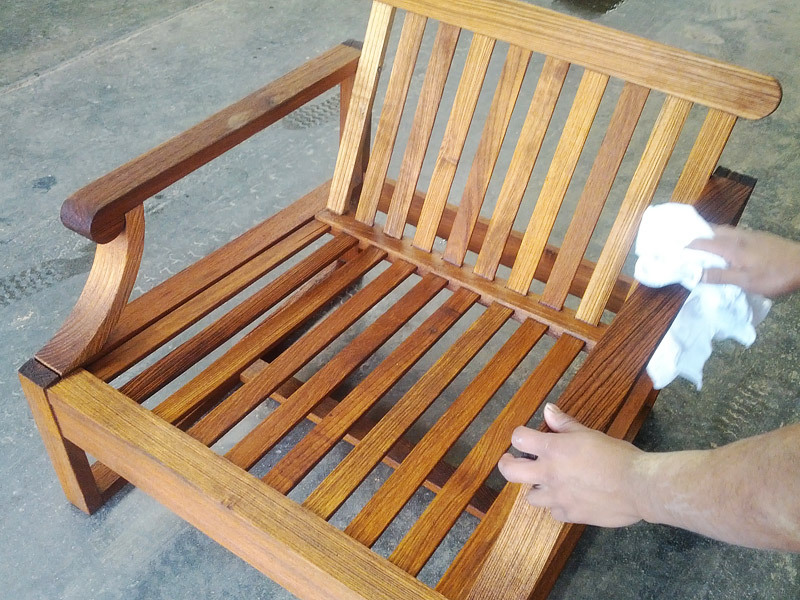 You will need to use a type of clear coat that is specially designed for teak furniture. To apply, lightly sand the surface and then apply 2 coats of clear coat with a clean rag. Let the first coat dry before applying the second coat. Clear coat should always be added after sealant and not the other way around. Teak oil shouldn’t be used because the oil can lead to mold and mildew. It also won’t do much in the way of preventing the graying patina from developing. In this case, you will have to keep sanding your furniture down to keep the honey brown finish. Varnish can chip the wood and cause it to flake. Applications for teak wood should never be all-purpose wood cleaners. 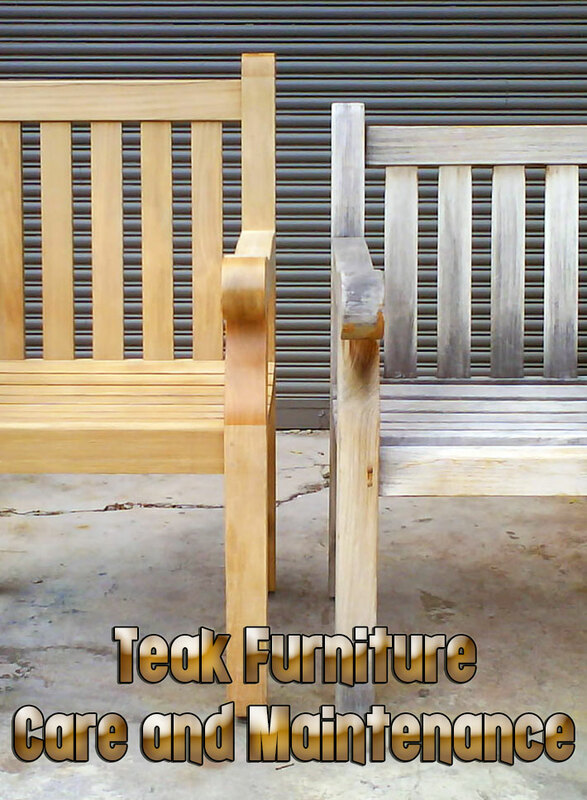 Teak is a special type of wood and requires teak cleaners, oils, clear coating, etc. 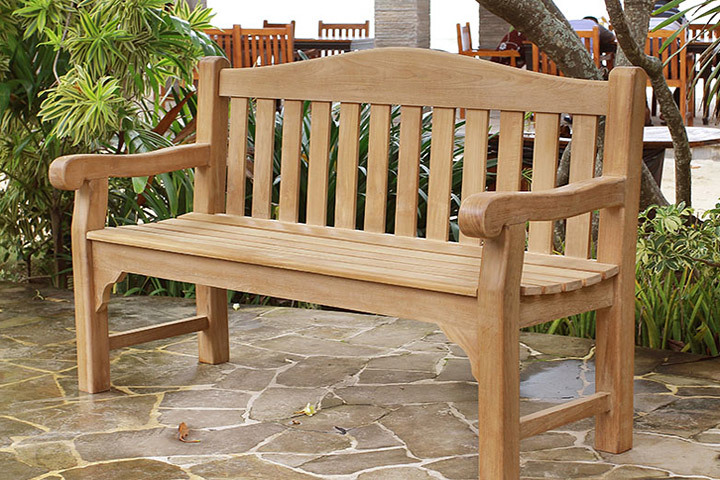 Water repellents/sealers aren’t necessary because teak is naturally resistant to water. Pressure washing is good for wood decks but not teak furniture. It can cause discoloration and damage to the wood surface. The surface will become coarse and splintered. Don’t use steel wool or brass wool on teak. These brushes are too abrasive. A simple Scotch Brite Cleaning pad (used in the kitchen) will work. Because of high moisture levels, it’s best to bring teak indoors during the winter. Using outdoor furniture indoors isn’t such a bad idea either! If this is not possible, at least make sure that water isn’t standing on your teak furniture and that the legs aren’t sitting in puddles. This can cause your furniture to deteriorate quickly. You can tell if mildew is present because the wood will begin to turn black. You can also use furniture covers to keep your teak protected during the cold winter months. 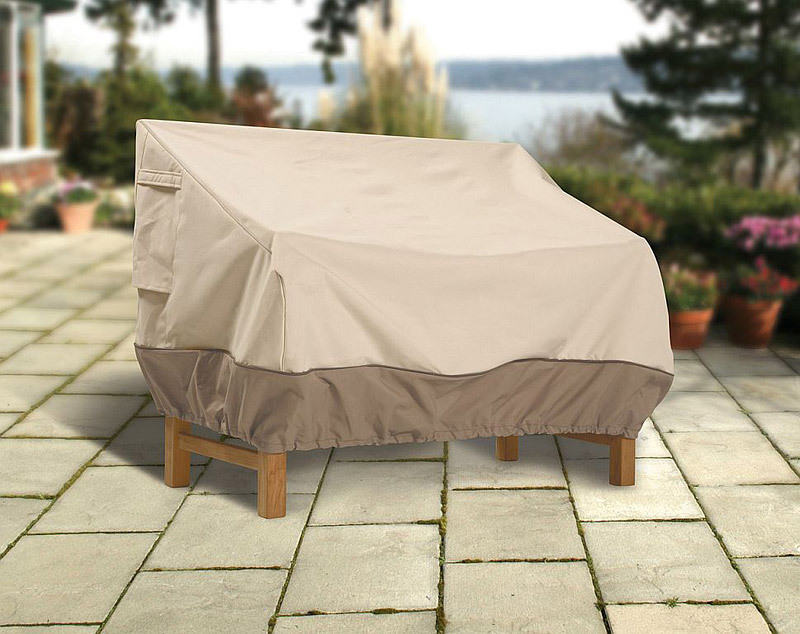 Furniture covers are a great investment that will help you get the most out of your teak set. Some furniture covers also have breathable air vents that promote air flow to prevent mildew. Bird droppings can stain wood very easily. It’s best to remove bird droppings immediately to prevent any damage to your outdoor furniture. This is another reason why it may be a good idea to invest in patio covers. They protect it from bird droppings, UV rays, and extend the life of your outdoor furniture. Sometimes you can get the original glow back after you’re teak has turned gray. You can use a caustic and acid cleaners or lightly sand the surface to remove the grayish layer and reveal the golden tone beneath. The gray patina is actually a natural defense against the weather. It is purely cosmetic and does not have any effect on the structural integrity of the wood. It develops as a result of oxidation caused by the sun. 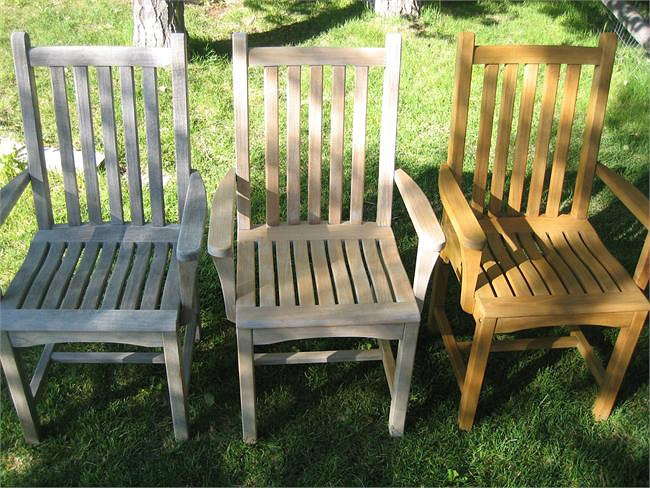 Golden Care products have proven to work the best at protecting teak furniture from UV rays and mildew. They can also be used to remove oil, food, stains, and varnish residue. ← How Fast Can You Reshape Your Body With Exercise? I want to get some teak furniture for my yard. Thanks for the advice about how teak is naturally water resistant. I would also suggest not leaving the teak furniture outside in bad weather as it could damage it. This holds true for any other wooden furniture, and any furniture that is not meant to be used for outdoors. We once did a survey and found that people, especially in warmer regions are not very careful about not leaving their wooden furnitures outdoor. Heat is equally bad for the moisture of wooden furniture as cold. We have written a long but useful article on furniture care and maintenance : https://zumpak.com/en/detailed-guide-furniture-care/ as we explained that room temperature and humidity level is ideal for furniture and any furniture kept outside for long will be damaged much faster than kept indoors.